VA Form VA10-10ez is a United States Department of Veterans Affairs form also known as the "Application For Health Benefits". 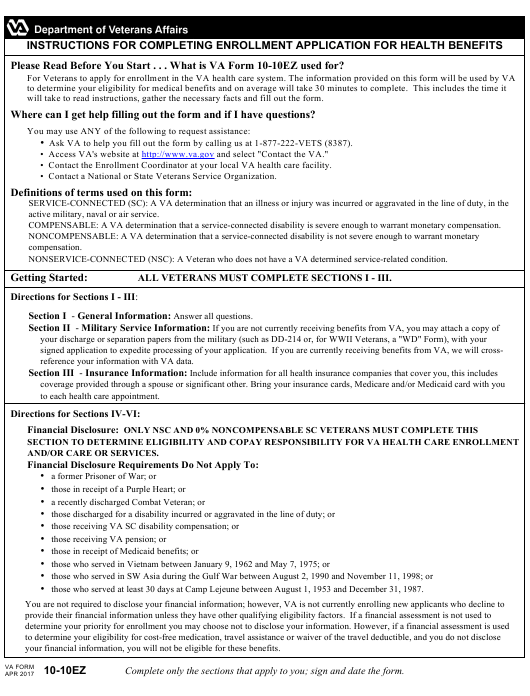 The form was last revised on April 1, 2017 - download an up-to-date fillable PDF VA Form VA10-10ez down below or find it on the Veterans Affairs Forms website. Please Read Before You Start . . . What is VA Form 10-10EZ used for? will take to read instructions, gather the necessary facts and fill out the form. Where can I get help filling out the form and if I have questions? Ask VA to help you fill out the form by calling us at 1-877-222-VETS (8387). and select "Contact the VA."
• Contact the Enrollment Coordinator at your local VA health care facility. • Contact a National or State Veterans Service Organization. active military, naval or air service. COMPENSABLE: A VA determination that a service-connected disability is severe enough to warrant monetary compensation. NONSERVICE-CONNECTED (NSC): A Veteran who does not have a VA determined service-related condition. ALL VETERANS MUST COMPLETE SECTIONS I - III. reference your information with VA data. to each health care appointment. those who served at least 30 days at Camp Lejeune between August 1, 1953 and December 31, 1987.
your financial information, you will not be eligible for these benefits. Complete only the sections that apply to you; sign and date the form. Your spouse even if you did not live together, as long as you contributed support last calendar year. Child support contributions. Contributions can include tuition or clothing payments or payments of medical bills. Section V - Previous Calendar Year Gross Annual Income of Veteran, Spouse and Dependent Children. Net income from your farm, ranch, property, or business. including tax exempt earnings and distributions from Individual Retirement Accounts (IRAs) or annuities. Section VI - Previous Calendar Year Deductible Expenses. sources. Report last illness and burial expenses, e.g., prepaid burial, paid by the Veteran for spouse or dependent(s). Section VII - Submitting your application. and dated appropriately, VA will return it for you to complete. 2. Attach any continuation sheets, a copy of supporting materials and your Power of Attorney documents to your application. take to read instructions, gather the necessary facts and fill out the form. and for other purposes authorized or required by law. Estimated Burden Avg. 30 min. (You may check more than one. 14D. NEXT OF KIN TELEPHONE NO. 14E. NEXT OF KIN WORK TELEPHONE NO. 17. WHICH VA MEDICAL CENTER OR OUTPATIENT CLINIC DO YOU PREFER? A. ARE YOU A PURPLE HEART AWARD RECIPIENT? G. DO YOU HAVE A VA SERVICE-CONNECTED RATING? B. ARE YOU A FORMER PRISONER OF WAR? DISABILITY INCURRED IN THE LINE OF DUTY? TREATMENTS WHILE IN THE MILITARY? AUGUST 2, 1990 AND NOVEMBER 11, 1998? 2B. CHILD'S SOCIAL SECURITY NO. YEAR, DID YOU PROVIDE SUPPORT? Medicare, health insurance, hospital and nursing home) VA will calculate a deductible and the net medical expenses you may claim. fees, materials) DO NOT LIST YOUR DEPENDENTS' EDUCATIONAL EXPENSES. agree to receive communications from VA to your supplied email or mobile number. my claim. Further, I hereby authorize any such third party or administrative agency to disclose to the VA any information regarding my claim. ALL APPLICANTS MUST SIGN AND DATE THIS FORM. REFER TO INSTRUCTIONS WHICH DEFINE WHO CAN SIGN ON BEHALF OF THE VETERAN.